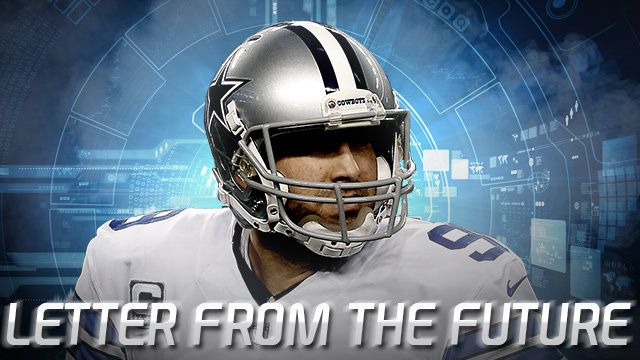 Letter from the Future: Cowboys playoff-bound? Published: July 22, 2015 at 01:02 p.m. Updated: July 22, 2015 at 05:41 p.m. I opened my inbox this morning to find a highly curious email: A letter -- seemingly from my own account and hand -- time-stamped January 2016. Sitting near a flock of pranksters here in the newsroom, I was sure it was a gag. Now I don't know what to think. I called IT, but they're scrambling, telling me: "We can't trace it to an existing IP. You're on your own, pal." Around The NFL editor Gregg Rosenthal's advice: Put it out there. See what floats in. Maybe others are getting Letters from the Future, too. This can't be real, you're thinking. But it is real -- you'll see in time. The date -- here -- is January 2, 2016, one day after the ball dropped and 24 hours before Week 17 blossoms into a flower of chaos. I'll soon explain how I sent this (and I'll prove it) but first there's something more urgent to discuss: the Dallas Cowboys. 1. Here in January, I can tell you that it's been a comprehensive roller-coaster ride for Tony Romo and friends. Dallas sits today at 8-7, facing a must-win tilt against Colt McCoy and the Redskins. With a win tomorrow -- and a Giants loss to the Eagles -- the Cowboys earn a wild-card spot. A loss puts Dallas down for a long winter's dirt-nap. Who knew Jay Gruden & Co. would trade RGIII to the Bills before Columbus Day? Who knew Colt would rip off three straight December wins, prompting Washington's success-starved fan base to call themselves "McCoy's McManiacs?" (Deeply cheesy.) 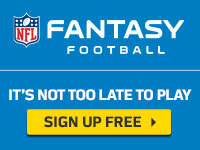 Still, McCoy's owned in 88 percent of fantasy leagues right now and has a chance to put the 'Boys six feet under: Wild. 2. Forget McFadden. That whole offseason pantomime over Dallas re-booting the team's clock-chewing ground game with a patchwork of underwhelming runners was a bust. The Cowboys don't come close to last year's run-play percentage of 51.6. Not with that raging pack of JAGs in the backfield, who leave Romo on the cusp of 500 attempts heading into Week 17. 3. Dez Bryant fantasy owners win big. I won't spoil it, but his statistical output will be remembered for decades thanks to an attack that leans heavily on three-wideout sets after the bye. Cole Beasley's flowing blonde locks also become a thing: The feisty little slot man blooms into a fan favorite who easily tops his 37 catches from last autumn. 4. Get ready: Brandon Weeden, of all men, saves the season with a 17-point comeback against the Jets in Week 15. Watching Romo's oft-shaky backup drop dimes on Darrelle Revis is mind-bending on a societal level, but the aging ginger delivers in a massive, nationally televised spot. 5. Stay in bed on November 17th. Trust me. 6. You -- and so many others -- tried your best with True Detective: Season 2. You re-watched episodes, pored through opinion pieces, even drove from West L.A. out to creepy Vernon/"Vinci" to better appreciate the plot. In the end: A tangled journey to mostly nowhere. But there's hope: the casting of Billy Bob Thornton, Jeffrey Wright and Natalie Portman -- in a plot based around mysterious animal sacrifices in Minot, North Dakota -- should make Season 3 a redemptive ride. Also: RIP Han Solo.